What are the options for securing your home? We explain how to safeguard your home and valuables from intruders. Probably the biggest development in home security over recent years has been the arrival of cost-effective video surveillance. Discourage thieves from targeting your home in the first place. Taking precautions means it takes longer for a thief to break in. Many are just looking for easy pickings – so if the property looks too difficult, they’ll move on. Your insurance company may also require you to take reasonable steps to safeguard your property (check what your policy says). Lock windows and doors, preferably with deadbolt locks. Don’t leave ladders and garden tools lying around – they can make breaking in easier. Install sensor-controlled automatic security lights. Mount a visible outside alarm box. Keep a barking dog on the property. Make your home look occupied during the holidays: turn lights on and off with an inexpensive power timer, keep the radio playing, have someone collect the mail each day or get your mail stopped, switch off the telephone ringer, leave washing on the clothesline, park a car in the driveway. Electronic burglar alarms have been around for decades. These intruder-detection systems usually combine sensors such as passive infra-red (PIR) motion detectors, door and/or window switches, and floor-mat switches. The system can be configured to sound inside and outside sirens that are louder than the pain-threshold for human hearing. They’re designed to make the intruder give up and to alert neighbours or passers-by. But many people are now desensitised to the wail of alarms because false-alarms are all too common. A quieter option is to have a silent monitored alarm. It makes no noise when the alarm is activated – but it alerts a security service. The monitoring service then sends a security patrol to visit the property – for which you are charged. You pay a monthly fee (about $1 per day) for the service. Monitored alarms have traditionally used dial-up technology over the standard (copper) telephone line. But times have changed. Many people have ditched their traditional phone line for an internet-based telephone service – and so the alarm service also has to use the internet for communication. This isn’t usually a problem: many alarm systems have this as a built-in feature. But if you have a monitored alarm and you’re thinking of ditching your phone line, check with your alarm provider first. Probably the biggest development in home security over recent years has been the arrival of cost-effective video surveillance. These systems allow you to monitor your property – using a computer or your smartphone – from any location where there’s an internet connection or mobile-phone coverage. 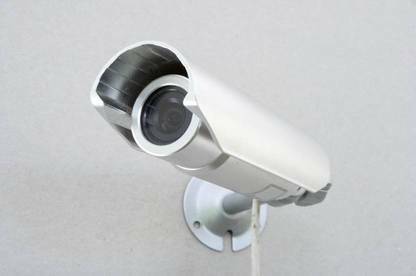 The systems are made up of one or more dedicated video cameras mounted in a suitable location in the home (outdoor versions are also available). Depending on the system chosen, the cameras are connected to the broadband router either by cable or WiFi. Alternatively with some systems you can plug the various components into the house’s power points and use mains wiring as the camera-to-controller communication path. Many cameras can switch to infra-red night mode and some have motion detection – which means they don’t have to continuously record images. That saves broadband data. Some cameras can be set up to alert your smartphone when they detect motion. You can then check the video image and raise the alarm if necessary. Even if the worst happens and your house is broken into, there are precautions you can take to safeguard your valuable items. Your jewellery and valuable documents such as family records and passports can be stored in your own safe. But make sure your safe is bolted down or otherwise secured – you don’t want to tempt the thieves to take away the safe! Alternatively, you can use a offsite safety-deposit box: small boxes are available from around $200 a year. It’s good practice to photograph jewellery and the serial numbers of electronic goods. But don’t leave the photos in the camera: it might get stolen, too. Probably the simplest way of securely storing photos is to use one of the many online photo storage sites such as photobucket.com. And to record serial numbers, you could also use the Serial Number Asset Partnership (SNAP) website run by the Police. Some household items can be made more difficult to steal. For instance, modern flatscreen TVs can be mounted using a wall bracket. The time it’d take to remove it from the mountings would probably deter a burglar. Getting independent security advice for your home is difficult. Most “advisers” will want to sell you one system or another. Use the Police website for general security advice. If you decide to purchase a security system, compare each system’s features and get several quotes.